When I lived in the ‘Mother Country’, Brighton was a medium sized, peaceful seaside town situated on the south coast of England. It was always a good place for us Londoners to visit for the day and was a popular holiday resort being some 86 kilometres South of London. 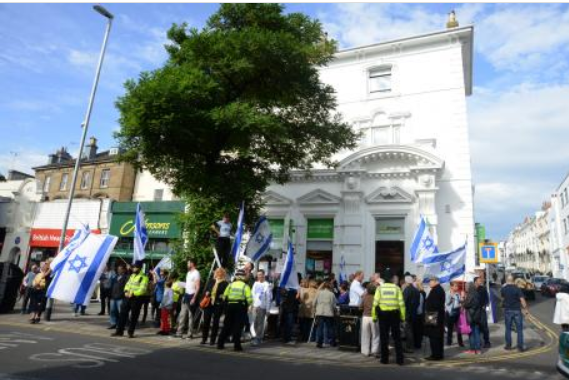 It was peaceful it seems until September 2012, when the Brighton and Hove division of the ‘Palestine Solidarity Campaign’ decided to start BDS actions against the newly opened “Green” SodaStream shop in the town. They bombarded the shop from the outset and continue to harass the staff to this day. This was SodaStream’s first venture into the UK., which apart from the usual EcoStream/SodaStream products , they sell Green initiatives including essential household items such as cooking oils, spices, shampoo and expanding into foods such as seeds, dried fruit and chocolate. Most of the products are produced by local producers and companies. Amongst the screaming and shouting there was a chance meeting of two men – a Jew and a Gentile who were completely taken back and disgusted by what they were witnessing. This chance meeting was to be the start of a gutsy, determined, non-denominational pro-Israel group, ‘Sussex Friends of Israel’, whose members counter the BDS actions of the Brighton and Hove PSC – Palestinian Solidarity Campaign in all weathers. Snow, sleet, hail and rain. Disgusted by the boycott, the two men decided they would go back to their communities to form a plan of action. The group (which later became Sussex Friends of Israel) grew rapidly. 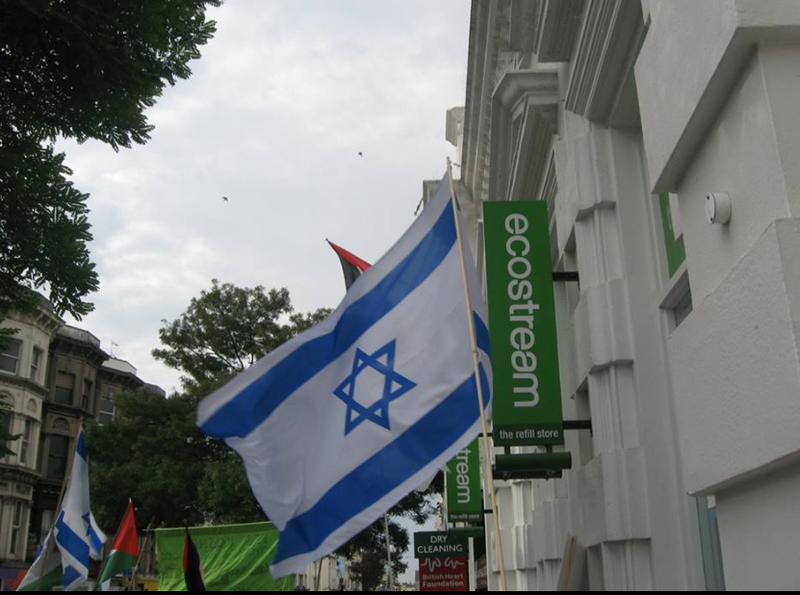 People of all denominations in Brighton were made aware of the EcoStream boycott and many started to turn out every week to counter the BDS. During 2012 and 2013, SFI also became active at the local University Israel-bashing seminars, hosted by pro-Palestinian lecturers. They attended these meetings and put forward Israel’s case to them, including “Israel Apartheid Week” at the local University campus. In the winter of 2012, SFI joined with large sections of the Jewish community against the BDS picket at the theatre, where the Israeli dance group Batsheva was performing. There were continual interruptions during the performance by BDS members shouting and screaming their usual ‘death to Israel’ slogans and were rapidly dealt with by security guards. SFI attended the Brighton Co-operative Annual General Meetings and put forward Israel’s case against the Co-Op’s boycott of goods from Judaea and Samaria. This year 2013, they handed a petition to the Co-operative in a stepped up campaign pertaining to this issue. SFI campaigned for the English Southern Water company not to cede to the BDS demands to prevent Israeli Arad Water Meters being installed in people’s homes, as well as trying to galvanise support from the public, not to have existing installed Israeli water meters removed from their own homes . Southern Water refused to meet the demands of the BDS and installed, as planned, the Israeli water meter upgrade. During the summer boycott of Sainsbury supermarkets, SFI members wrote to Sainsburys thanking them for refusing to boycott the goods the BDS were petitioning against. Sainsbury’s replied that they were not considering any Israeli boycott. Citing that quality products were more important than factional politics. The Zionist Federation of Great Britain and Ireland also issued a BUYcott initiative for EcoStream, encouraging shoppers to support the store. 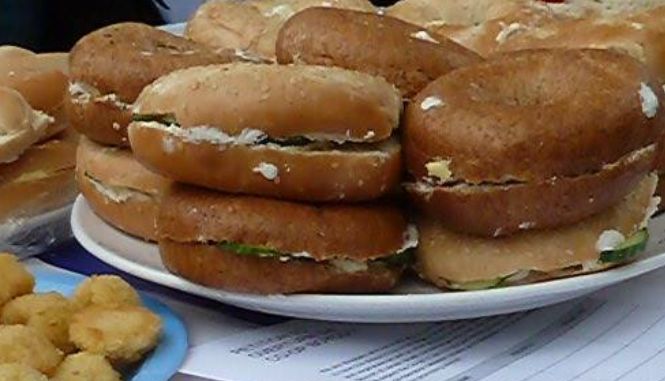 The initiative “Bagels Against Bigotry” was put into motion with unprecedented success, first in July, then in September of 2013. The latter was planned against the BDS “National Day of Action march and demonstration outside EcoStream” and resulted in the BDS being drowned out by the large SFI counter-demonstration, which forced the Police to move the BDS activists to the opposite side of the road The BDS were not permitted near EcoStream outlet. A member of ‘Jews for Justice in Palestine’ was found by the police to be munching on the SFI street party food of bagels and smoked salmon, before being escorted back to the opposite side of the road to her BDS comrades. That same day, EcoStream officially announced it had been the best day of trading profit since it opened the year before! Online simultaneously, Sussex Friends of Israel Facebook saw a sudden and unprecedented hike in Likes and Shares, going from 252 Likes above 2,000 in approximately 4 months, one picture of one of our SFI members holding a poster, hitting over 150,000 views, and also “Top tweet” twice on Twitter where it had evidently copied from Twitter via Facebook. The diversity of countries that responded to SFI Facebook included the following: Israel, Romania, Italy, Russia, Czech Republic, Southern and Northern Ireland, Scotland, Pakistan, Cameroon, Wales, Australia, America, Canada, Honduras, Celtic Region, Sweden, India, New Zealand, Ghana, Igbo, Guatemala, France, Switzerland, the Israeli Embassy in the UN. The most recent to respond to SFI Facebook is the Israeli Embassy in the Vatican! In September, the Knesset extended moral support to SFI on Facebook, adding to the growing numbers of Israeli Embassies that had also given support, as well as over 250 NGOs and others who had personally contacted either SFI Facebook or one of the Administrators. “SFI is somewhat of a miracle. But beneath it, there lies a core of people, made up of all races, religions creeds and colours. Rich, poor young and old, LGBT, people who have worked unbelievably hard on all platforms who have had enough of the BDS dominance, lies and hatred. Following a day of heated, conflicting protests on November 2nd, a video has emerged showing evidence that anti-Israel campaigners have within their ranks blatant antisemites. The crucial part of the video [1 minute 25 seconds] comes when Cobb and his fellow interviewer ask the man why he is boycotting Ecostream in Brighton, a shop which is Jewish and Israeli-owned, and if the man would boycott it if it were a Muslim or Arab-Israeli owned shop. 2012-2013 global sales at SodaStream, have risen more than three-fold since 2009. The group booked sales of over $436 million last year, with net profit up 18 percent to $44 million. Written with submissions by Mona Young with additions and edits by ‘me’. Since posting this yesterday, this ‘lovely’ video has come to light of these vile people for the PSC harassing and intimidating shop workers. …..and SFI HAVE JUST RECEIVED THIS LETTER FROM A LADY WHO VISITED THE SODASTREAM FACTORY IN MISHOR ADONIM YESTERDAY!! I visited the SodaStream factory today. A young Palestinian, called (full name given but withheld to avoid BDS intimidation), who is studying ***** at ****** University, told me that “SodaStream is the greatest!” He earns 6000 shekalim per month, rising to 12,000 per month, instead of 1000 shekalim in any other part of the Arab world for such work. There is equality not only between employees, but between managers and employees. Palestinians, Russians and Israeli Arabs are managers. They get good food for lunch (we had it too). They get clothing, transport to work paid for, fun days, special permits and visits to the beach near Tel Aviv. Women work there too, next to the men, unheard of in the Moslem world. Come and see for yourself. I am going to suggest to Pat Clegg that she comes and has a look. This is the web site of the Brighton and Hove division of the ‘Palestine Solidarity Campaign’ I urge you to look at. It’s truly pathetic. The Palestinians refused the UN plan to partition their homeland into a Jewish and a Palestinian state at the end of the British Mandate (2nd map), on principle and because it would give a totally disproportionate share of land (56%) to the Jewish population who then were only 33% of the population — and owned only 8% of the land. But in 1948 the founding of the state of Israel was unilaterally declared and this was followed by fighting between Israeli armed gangs and Arab forces attempting to defend the Palestinian Arab population. Great article! The Sussex Friends of Israel are wonderful people!! !